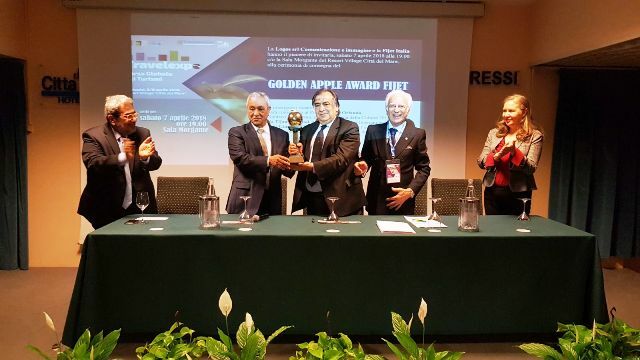 The prestigious Golden Apple Awards Fijet International was awarded to Palermo, the Italian Capital of Culture 2018. The prestigious award was presented to the mayor Leoluca Orlando by the president of Fijet International Mr Tijani Haddad, in the presence of the members of the international delegation, and by Giacomo Glaviano president of Fijet Italia, Italian Federation of tourism journalists and writers. “A recognition given to me, but goes to the city and the entire metropolitan area – explains Mayor Orlando -. This Oscar for Tourism, which comes from the world federation of industry journalists, confirms that for Palermo tourism development has become an opportunity for economic development. We must be adequate to seize this opportunity that we have painstakingly conquered “. The official ceremony took place in the framework of the “Travelexpo” Global Tourism Exchange, which took place in Terrasini. The award is equivalent to the Tourism Oscar, and is awarded each year to a city or personality for the work done in the promotion of tourism. Over the years it has been delivered to cities such as Moscow, Dubrovnik, Croatia, Bulgaria, Romania. The choice of the City of Palermo was proposed two years ago by the Italian president of Fijet Giacomo Glaviano, member of the international commission for the award of the Golden Apple Award, which includes Staven Plamen (Bulgaria), Mahamed Attia (Egypt), Tina Cubrilo (Croatia), Walter Roggerma (Brussels) and Natalia Tarasenko (Russia). “The candidacy of Palermo for the title of Italian Capital of Culture 2018 – highlights the journalist Giacomo Glaviano – has a metropolitan dimension because it involves more than one million inhabitants and extends from Monreale to Castelbuono through Palermo and the towns of the coast”.